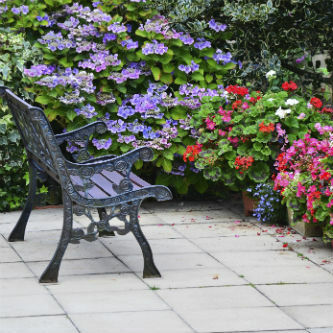 Houston patio landscaping designs are often dotted with beautiful flowers and gardens but you may not know exactly where to begin with planting some of these perennials and annuals on your own property. Flowers in Houston Texas are best suited for mild winters as well as hot and humid summers. There are some super plans for southeastern Texas as well as perennials and annuals that thrive in this climate. Any of these perennials and annuals would make an excellent addition to your patio area. Keep some of these top selections in mind for all of your gardens this year. Texas Gold Columbine: Hinckley Colombine is very rare in the wild but only native to Texas. This rare plant comes in buttercup flowers with leaves that resemble ferns. Texas gold will reach 2 to 3 feet tall and it prefers gardens which have well-drained soil in part shade. This is best used for shady areas and it will sometimes die off during a very hot or dry summer. These make for beautiful accent pieces in your garden for framing other flowers. Hibiscus Lord Baltimore: Lord Baltimore is a Hibiscus that has a chance to form 10 foot wide scarlet flowers when they bloom. These flowers come out in July until the first frost and they grow around 5 feet tall and extremely wide. These are perfect for perennial gardens as well as for attracting butterflies and hummingbirds around your patio. You often see these flowers growing your ponds because they grow very well in moist soil. Belinda’s dream Rose: These are roses that are perfectly suited to growing Texas’s climate. These are commonly referred to as one of the best flowering roses in the world and they grow very hearty with a chance of petal counts of more than 100 in the blossoms. These roses can grow just as easily as weeds and reach heights of around 4 feet tall and 3 feet wide. If you want something simple, beautiful and resilient this is definitely something that you should consider. Keep some of these top flowering plants in mind for brightening up your Houston patio landscaping.